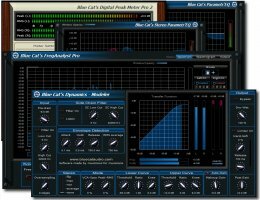 All you need to finalize your mixes or master your audio tracks is here: visualize, monitor and verify the content of your tracks with ultimate precision thanks to Blue Cat's Peak Meter Pro, Blue Cat's FreqAnalyst Pro and Blue Cat's StereoScope Pro. Adjust the spectrum with Blue Cat's Liny EQ and Blue Cat's Parametr'EQ, improve your tracks' dynamics with Blue Cat's Dynamics and maximize the loudness of the track with Blue Cat's Protector. Last but not least, Blue Cat's MB-5 Dynamix will let you finalize the dynamics and spectral balance.